By nature, bass are coverholics. And, virtually every body of water has cover of some type. That’s where to start looking. Summer weather keeps the fish feeding, the longer days give you more time to fish, and night fishing can also be very good, especially on heavily used lakes. Best feeding times on the day shift are generally dusk and dawn. And, while bass may be feeding in shallow water, deep water nearby makes areas better. Start with equipment – 6 ft. 6-in and 7 ft. medium heavy rods and 6:2:1 retrieve reels can cover a lot of applications. Specialty lines, like the nearly invisible fluorocarbon and strong, heavier braid are great for certain presentations. But quality monofilament, like Sufix, can cover all the approaches, too. Trees and laydowns offer good bass hideouts. Fish the outer edges of the wood with a ¼-oz. jig and craw combo or a Senko unweighted stick worm rigged weedless. Also, run a square bill shallow crankbait, in a crappie or bluegill pattern slowly through any limbs closer to the trunk. Square bills deflect easier and hang up less in wood. Stick with a heavier line, like 17 to 20 lb. here. Tackle inside weed edges with surface baits like a Rebel Pop-R or a Zara Spook. Make long casts and work the Spook back in a left/right pull “walk the dog” retrieve as it will create a ruckus. Always use a feather or mylar dressed tail treble on the popping baits. The gentle sway of the feather and the sparkle of the mylar do attract fish. Both fluorocarbon and braid lines sink, so definitely fish the surface with mono. A Senko or jig should also join the mix. Stumps can have elaborate root systems that don’t always show on the surface. Cast close, but also cover the outer areas. A surface bait like a Hula Popper or Smithwick Devil’s Horse, which has front and rear spinner blades, can draw fish out. It doesn’t hurt to work a jig or Senko on the outer edges, too. Black and blue jigs and black with blue fleck Senkos are good choices. Pads, especially when another weed grows close by, are good, as are denser weed or “slop” beds. Surface frogs like Booyah Bait’s Pad Crasher and buzz frogs like Zoom’s Horny Toad are good bets, as are regular buzz baits. Black, white and chartruse are good colors. Just remember, if a fish blows up on your bait, wait till you feel it before setting the hook. And don’t be afraid to flip a jig/craw into weed pockets. Look for docks that have tops closer to the water with weeds or other cover nearby. Wood docks are better than metal. Pitch or skip an unweighted Texas rigged tube, Senko or a light jig up under them. Bass also use pontoon boats, especially the wash out area created by starting the motor. Go as heavy as possible, to winch the fish out before it can wrap around the dock posts. Rock rip rap and retaining walls can be fished with shallow or deep crankbaits, based on how far out the bottom cover, (from building) extends. 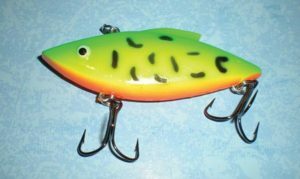 Also, toss a double blade willow leaf spinnerbait closer to the cover and use a Colorado blade (for vibration) on the deeper edges. Grass mats consist of live weed growth that hits the surface then forms a canopy. Another type consists of grass and materials that have been uprooted and blown together. Sizeable bass can use these. Use a heavy weight, depending on cover thickness, and a straight tail plastic worm so it has less chance to hang up before it penetrates. This is another place for heavy monofilament or braid. Look for areas like points, deep weedlines, fish cribs and rock piles with your depth finder. A lake map can come in handy for finding these spots. Main points can be fished with surface baits as well as bottom bumping and mid-depth baits. Walk a Zara Spook over the top of the point. The Pop-R and the two prop Devil’s Horse can be worked slower. Dragging a ½ oz. football jig and plastic craw covers the bottom. To check areas fast, I’m partial to the Rat-L-Trap because it is a sinking, rattling bait, with no limits on how deep, shallow or fast you can work it. Make sure to look for nearby “secondary” points. They are less defined, but can be good because they are constantly overlooked. Weeds are the most frequent deep cover on most waters. Look for weedlines close to drop offs. Active fish prowl the edge, where a ¼ oz. bullet head jig tipped with a 7 in. 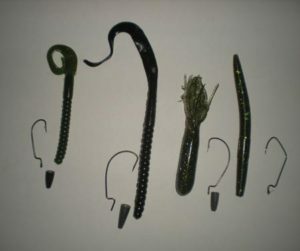 black Berkley Power Worm, usually called a “jigworm,” works well. When the fish move back into the weeds, a Texas-rigged Power Worm can go in after them. Even consider a large, 10 inch worm, especially if you fish at night. Also, try running the ½ oz. Rat-L-Trap over the tops and along the edges. The weeds grow shorter as sunlight penetration fades. And you can control the depth of the Rat-L-Trap to track them. Fish cribs are usually shown on lake maps. Rock piles in deeper water can also be hot spots. In lakes with both smallmouth and largemouth, the smallies usually gravitate to the rock. No rock means both species use the same areas. Jigs, tubes and worms are effective in deeper water. Try different sizes to see if one works better. 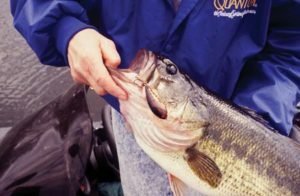 Bass will also school and suspend out from structure, depending on food location or boat traffic. If there’re no fish on the drop off, this may be where they have “disappeared.” Use electronics and start looking out from the drops. Then drop a jigging spoon into and past the fish, so it looks like an injured baitfish. Rivers and bridge pilings can be overlooked summer hot spots. Smallmouth love river current and use larger rocks or logs to ambush prey. Largemouth like quieter areas, but will feed in current. 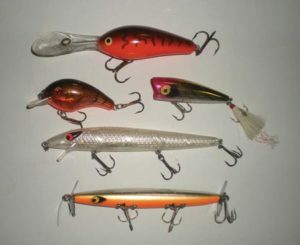 Mepps spinners, crankbaits, jigs and Senkos can all catch fish in moving water. Dams offer highly oxygenated moving water that funnels food and draws baitfish to feed. Bass, even largemouth, follow, holding just off the main current. This is the one area I would fish with live bait, like crawlers and leeches. Sometimes it pays to focus on relatively small areas. And live bait shines in this situation. Use just a no. 6 Eagle Claw aberdeen hook, sinker and bait. If you hang up, use a small float to keep the bait off bottom. Fortunately for us anglers, there are bass in most Badger state waters, and plenty of cover. And summer’s the most pleasant weather of the year to seek them out.